I was up over the Bluewater and Lakeside shopping centres at noon today as a photo flight for one of the national newspapers. While everyone, the media included, appears to expect a record number of shoppers, I can tell you that neither one of the two shopping centres had what I would describe as an unusual amount of traffic and I did actually wonder if John Lewis was closed. If I hadn't known it was Boxing Day, I might have thought of it as being a normal Saturday afternoon's trade! Captain Snap was flitting about just before noon today, taking photographs of the Christmas Eve activity below and particularly at the Westwood Cross shopping centre on the Isle of Thanet. I've uploaded some of my photos which take in Westgate, Margate and Westwood Cross on to Flickr and you can find these here. I can't admit to seeing as many people shopping as I would have expected at the peak time of the retail season but judge for yourselves! My apologies for the quality as they are not as sharp as I would wish. The light is very poor today and the best my camera could offer for a high-speed aerial setting was ASA 500. I'm tasked with going over Bluewater for one of the daily papers on Boxing Day and so I'm hoping for rather better conditions then. 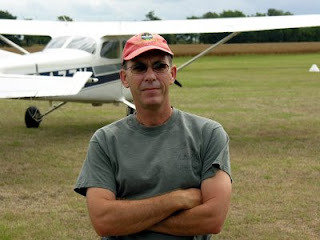 Not for the nervous flyer perhaps but the video below displays such outstanding airmanship on the part of the pilot, that other than gawp with admiration at his skill and fast reactions, I can't really pass comment! Having revalidated my night rating at Manston airport yesterday evening, I decided to try out the new Pentax camera on the growing 'Thanet Earth' construction site on the way back to to the base airfield this morning. 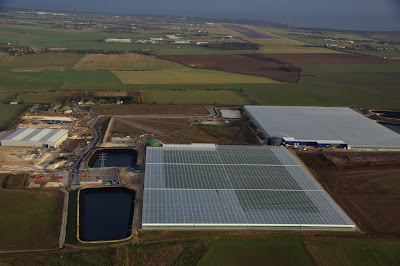 Not the best of days to take photos with a 1,500 cloud base but I thought that curious readers might like to see the current progress of the world's largest greenhouse in Kent and the only place you are likely to have a bird's eye view of it all is here I suspect. Should you require a detailed and hi-resolution aerial survey then please ask. 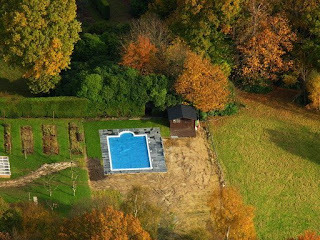 'Captain Snap' was in the air for the Daily Mail yesterday, the target of interest being Heather Mills' swimming pool in Sussex. I had been to the house once before about two years ago, when the local authority asked for some photos of an outbuilding extension but this time, there is reportedly some kind of planning dispute involving the lovely Heather's new swimming pool - I assume she received the house as part of the divorce settlement with Sir Paul - and at least two newspapers asked for photos with the Daily Mail seeking an exclusive. Friday was the first decent break in the weather for a week and offered just enough time and sunshine to take the required photos. No sign of Heather though. If she's any sense she'll be far away in the sunshine. Captain Snap would be too but needs a larger aircraft to get to the West Indies without a stop! One more lucky marriage proposal today! Even luckier in the circumstances of the weather over the last week. Northern Ireland was a washout and you'll understand why if you saw the news from the Lake District with two thousand runners stuck up a mountain in torrential rain and gales. The cloud was too low to support the Chelsea game on Sunday but at least our luck was in for 'Heroes of Sport' over Manchester central on Friday afternoon. So congratulation to "James" on his proposal to "Jo" of Doncaster this afternoon. Rather like that famous quip from the film, "'Shakespeare in Love' "It's a mystery to me but it all works out in the end." You might be forgiven for thinking that summer had returned today. 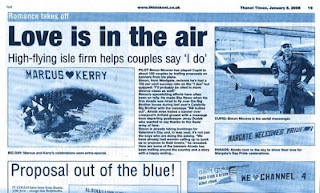 The last time I recall the weather was this good in October was in 2000 and it helped us achieve the unexpected, with the BT Vision banners over the Scotland vs. Norway international football match at Hampden Park and three league matches in Belfast with a second aircraft at the same time! Tomorrow, Sunday, looks set to start with fog and we have the beach races to cover for Proppa.com at Weston Supermare, with a fallback - if it's foggy - to the UK Superbikes Championships at Brands Hatch. The late summer weather has bought out the lovers as well and I've to fly two marriage proposals within ninety-minutes; one over Whistable Harbour and the second past Canterbury Cathedral on Sunday afternoon. The 100% proposal success record still stands! "I would like to say a very big thank you to you and your team at Airads for making the day a very special one for Emma and myself. I have been very impressed with your service and professionalism from start to finish. The weather was against you and despite this you still flew the banner!" BBC Essex radio went looking for the mysterious Emma and recorded a nice interview on the subject as did the local paper. 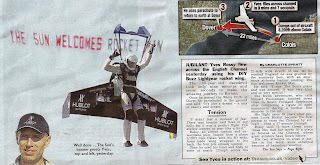 Airads and The Sun Newspaper were the first to welcome pilot Yves Rossy today as he became the first person to fly between France and England on Friday with a jetpack strapped to his back. The simple kerosene-burning jet turbines propelled him the 22 miles between Calais and Dover at speeds of up to 120 mph. The journey took just under 10 minutes. The 49-year-old Rossy, who calls himself "Fusion Man," ignited the jets inside a plane before jumping out more than 8,000 feet above ground. After a period of free fall he opened the wing and soared across the water. With no steering controls, the only way to change direction was like a bird, moving his head and back. When he reached Dover, he released his parachute and drifted down gently before landing in a field with The Sun newspaper's welcome right behind him. Rossy traced the route of French aviator Louis Bleriot, who became the first person to fly across the Channel in an aircraft in 1909. It was absolute mayhem above the landing site, with unauthorised French pilots accompanying the Jet Man, not talking to air traffic control and presenting a real hazard to the camera helicopters and the banner aircraft. 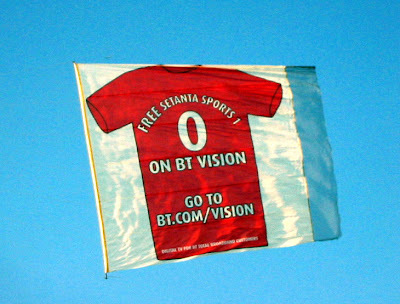 Floating over Premier League games today with the BT Vision banner. Our presence clearly didn't help the score between Tottenham and Wigan; a nil, nil draw but arriving as I did just before the match started, I'm sure lots of people saw the banner; the same being true of the match at Middlesborough earlier. It's a really big banner and 30 feet high and you have to appreciate the effect it has on the performance of a small aircraft. You have to watch something that big very carefully indeed and even the simplest manoeuvers demand considerable effort and attention; particularly to the aircraft speed and the potential for a stall. It's certainly not an occupation for nervous flyers or even nervous pilots. Today with a nice collection of power lines situated on the climb out, attention to both detail and aircraft performance were absolutely vital. As if by a miracle, a day of good weather and that allowed us to fly the BT Vision and Setanta Sports football shirts banners over Manchester United vs Liverpool, Manchester City vs Chelsea and Blackburn Rovers vs Arsenal, as well as sneak in a marriage proposal over Southend pier as well. The lucky lady, Annie, said "Yes" I'm told! 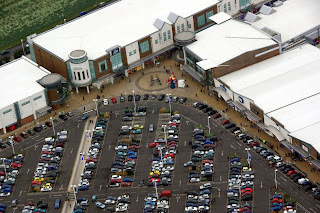 Tomorrow, it's over to the Lakeside shopping centre for another proposal and next week its more football matches, involving West Bromwich, Chelsea, Tottenham and Manchester United. Meanwhile, we have to frantically move the banners around between aircraft and pilots, rather like a bizarre game of musical chairs with the added excitement of not knowing whether UPS will either lose them or forget to pick them up. A mixed bag last weekend, thanks to the weather. All the BT Vision banners flew over the North-east football venues, as instructed but in the South, I found it impossible to reach the slot we had before the start of the Bournemouth airshow, thanks to low cloud sitting on the hills around Compton Abbas. Tuesday was the day of the COI public safety film at Bembridge on the Isle of Wight but while the brand new Coastguard helicopter had no problems operating, the strong winds made picking up the supporting banner impossible. Fortunately and racing back to Sandown on Wednesday, I managed to lift the banner over the pier before the wind became excessive again. To give you an idea of how strong the westerly wind was, I managed to return from Sandown to Manston in 50 minutes. Beyond the up and coming Bournemouth Air Show this weekend and several Premier League football matches on Saturday, there's another interesting challenge ahead on Tuesday involving fliming with the central Office of Information (COI). The COI are making some kind of beach/water safety TV advertisement and Airads has been asked to fly over to Sandown on the Isle of Wight, with a banner saying: "Do You Know Where The Kids Are?" There's a slim chance that the forecast good weather for the coming weekend might just last into next week's and it would be a nice change to fly with the Sun out. Today, we only managed to get one of the two aircraft booked for a display over Blackpool for the West Lancashire Chamber of Commerce. a wall of cloud prevented the Harrogate-based Piper Cub from crossing the Pennines but one aircraft was still better than none in the end! A packed Reading Festival this afternoon and with this and the Leeds Festival on Friday and a poposal over Southend Pier yesterday, you might think it was summer after all! Next week it's the Bournemouth Airshow and a whole run of east coast premier league football games as we start to reach the busy peak of the aircraft banner season. Watching the closing cermony of the Beijing Olympics, it occurred to me that anyone interested in the possibility of an aircraft banner near the London Olympics in 2012really needs to start asking about it sooner rather than later. With only five or so capable aircraft in the country, the big advertising companies may be in for a surprise! When I find a moment I will try and upload a couple of video clips from the Reading Festival today and place a YouTube link here. 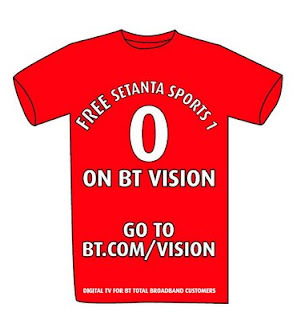 In what is the broadest aerial advertising campaign in the UK to date, British Telecom (BT) will in the coming weeks, will be promoting Setanta Sports, and the BT Vision Broadband service over premier league football matches in England, Scotland and Northern Ireland. Airads Operations Director, Simon Moores, commented: "I'm delighted that Airads has been selected as the aviation partner for this campaign. It's a significant operational challenge, with multiple aircraft over games on the same day and I very much hope that the summers changeable weather will relax long enough for us to be able to deliver all the flights sucessfully". Another disappointing August weekend, weather-wise at least. We hadn't expected to be able to run any of the weekend's programme with yet another pulse of low pressure appearing from the Atlantic but miracles happen and in this case all the banners flew exactly to time before the weather closed in. So that was 'Helen' #3 proposed to and accepted - must be a romantic month to be a Helen - and the V-Festival at Chelmsford too. Coming-up of course is the Reading Festival and some filming for the Central Office of Information and it would be nice if before Autumn finally arrives, if we could just have two weeks of real summer weather. Too busy to post lately but finding time to draw breath, today was unusual with two ladies named 'Helen' being proposed to at different points across the country in the same hour by different aircraft! If that isn't unusual enough then there's a third Helen coming-up in the next week, so another proposal surprise in store, which I hope will keep our 100% record. Of course, 08/08/08 was a big day for weddings, as well as the Olympic Games and despite some rather nasty weather, we managed to achieve all of our flights on time. Tomorrow, Sunday, isn't looking so good, with a flight booked over the Climate Camp in Kent and a second banner over Ashford, with 40mph winds and rain forecast. It's been a very difficult summer so far, with weather that has been more autumnal than August. with both Reading and Leeds festivals in a week, let's hope for a ray of sunshine before the summer disappears altogether. We did rather wonder what the ME108 was doing parked next to our aircraft at Northampton's Sywell airfield last week, with TV cameras and a yellow WW II Harvard trainer in close support. Now we know. The Times newspaper was running a story on the predecessor of the famous ME 109 but it's a pity the author can't spell 'Messerschmitt'. 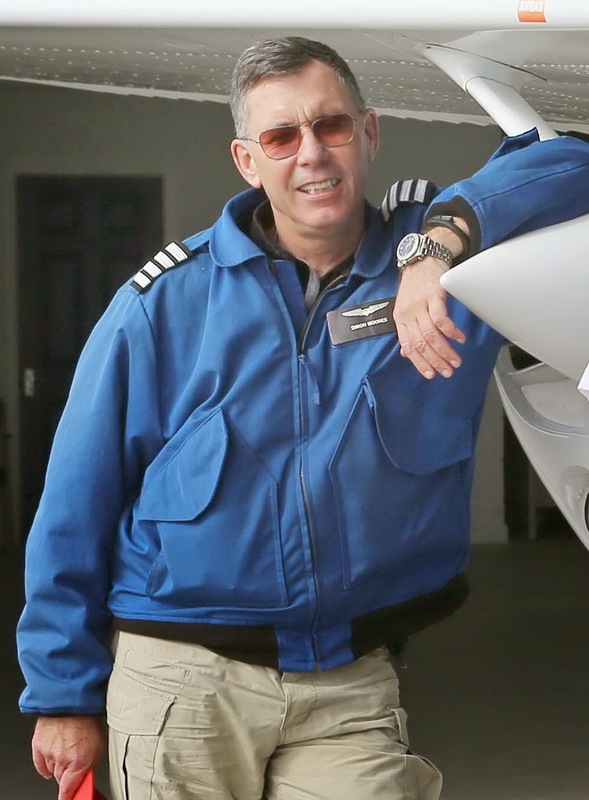 "Now that we were airborne, pulling Gs seemed mercifully out of the question. A wall of black cloud was marching in from the West. We levelled out at 1200 feet and James muttered something into his headset. “What was that?” He’d been telling Air Traffic Control we were going straight back down." You can find The Times ME108 video story here. Google has arbitrarily decided that our website at http://www.airads.co.uk/ may be unsafe. It actually hasn't said why and has forced us on a circuitous route which involved uploading an HTML file which proves that we actually own the website rather than the Shanghai mafia. The trouble is, that it will take some weeks I understand before the 'Googlebot' revisits and clears the offending tags and there's absolutely nothing we can do about it other thanassure visitors that http://www.airads.co.uk/ which is hosted by UK company ShopCreator, appears to be perfectly safe and owned and administered by us. Here, in in conclusion is the result of a McAfee site scan of the main website: "We tested this site (airads.co.uk) and didn't find any significant problems." It’s Tolpuddle time again. 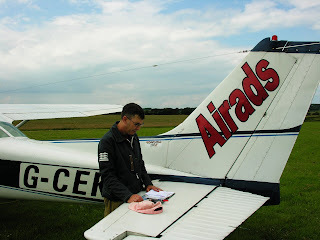 This weekend Airads has two aircraft up simultaneously over the Tolpuddle Martyrs anniversary rally. Organised by the TUC, this festival takes place in the village of Tolpuddle, Dorset and takes place from Friday the 18th to Sunday the 20th July. One of the banners we are flying is for the RMT Union – we flew it at the miners march in Durham last week – and one is for the Community trades union. Last year the weather was pretty miserable on the same occasion and so we are hoping for clear skies, for a change this summer at least. On Saturday we are at Kemble and operating around Swindon, advertising the Womad, ‘Charlton Park 2008 Festival’ which takes place between 25th and 27th July at Malmesbury in Wiltshire. Two proposals in ninety minutes today over Whitstable and Southend. I hope to have the video available here soon! With the strong westerly winds today I had thought the chances of flying any banners today were poor but we had a little luck and Leysdown airfield on the Isle of Sheppey was sheltered enough for us to pull it off. A Trades Union march at Sevenoaks tomorrow makes for a complete contrast to the sound of wedding bells in the air! It looks as if the July Tolpuddle Martyr's Rally this year is going to be a busy event with two banners to fly for Trades Unions this time. The RMT Union have opted for one of our largest and a recommendation for clients is that letters be at least 5' tall to be easily read from the ground. 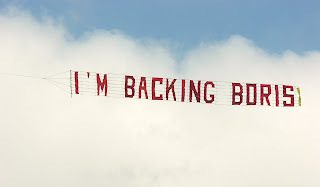 There's sometimes a temptation to cram in as big a message as possible into an aircraft banner without realising that small type is very difficult to see fromt he ground. Keep it short and simple and that, in our experience normally works the best! Plane banner, proposal, message, airads, aircraft banner, Simon Moores, Sky Banner"
A bizarre message on the first banner of the Sunday at the 2008 'Isle of Wight Festival'. "Clare & Anna Show Us Your Hooters!" But what can it mean I wonder? Anyway, 'Hooters' aside, we flew the 'Welovefestivals.com' banner too and I've loaded seventy aerial photographs of the festival from both days for you to see here on Flickr.com and a complete video will be up on YouTube in the next couple of days. Come back here to find the link or look for 'AiradsUK' on YouTube. You can also find the story and photos on The Isle of Wight Beacon website here. Pictured, me doing some planning at Bembridge and today's co-pilot Charles. I quite forgot to take a photo of Co-pilot Jason yesterday, so next time mate! Three banners over the Isle of Wight Festival this afternoon and I hope to have a video, taken from above, up on YouTube in the next couple of days, so watch this space. Today we had John propose to Grete and then surprise, surprise, Grete propose to John, followed by a final message to Jacqui to round off the day. You can see this clip here on Meridian News Tonight. 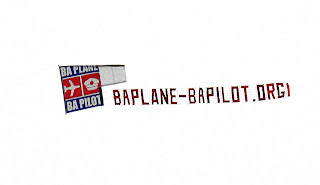 It was one of those remarkable coincidences that two people chose an aircraft banner to propose to each other on he same afternoon and I'm sure, it went down well with the 30,000 or more people milling around below. John emailed us afterwards with this message: "Just a short note to say thanks for a fantastic day for Grete and I, One that we will never forget thanks to you guys. So glad you got me up first followed by Grete, awesome. Many thanks"! Back to the island on Sunday then, to tow a banner for two hours over the event with the message "Welovefestivals.com". Around 50,000 fans squeezed into Queen Victoria Square and from above the streets appeared packed, all the way from the football ground. The flight itself was a matter of luck. The strong wind conditions were arguably 'out of bounds' but fortune smiled on the attempt and the banner was airborne on time. Not a great Bank Holiday weekend. Two days work in Skegness postponed until July and a Saturday wedding in Kent, 'Blown away' by the strong winds. It's always annoying when the 'Great British Summer' starts playing its tricks but let's hope that June wll live up to expectations and that July won't be an unhappy repeat of 2007, with its constant rain and flooding in the South West. 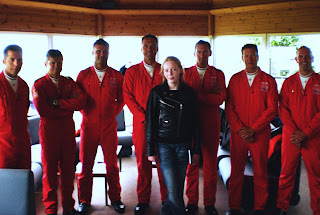 With no scheduled flights on for Airads today, the youngest member of our team, thirteen-year old Charlotte, managed to persuade the Red Arrows to sign her logbook at Manston today. As she's been flying with her father since the tender age of seven, she's planning on a career in aviation and from the photograph, she's obviously making the right friends! No flying today, far too windy and lucky that nothing was booked. We have one aircraft out for its annual service until at least Saturday and the second rapidly running out of working hours until it's own 'Annual' in two weeks. As these are working aircraft, they are subject to 50 hour servicing and a complete annual maintenance regime every twelve months. Very expensive and they never work out to suit the schedule. Once you reach 50 hours, that's it. Everything stops until the full maintenance check has been done at an authorised engineering facility; and you can't just roll-up like QuickFit! As there's no flying, I've been playing with the video editing software again; I don't get much chance to experiment. So here's our entry for the 2008 Cannes Film Festival. Seriously though, we were asked by a client if we could fly the event but French 'Red Tape' stood in the way, which is ironic, in a way, as both my grandparents were big 'Stars' of the pre-war French cinema and one is buried there. Plane banner, proposal, message, "aircraft banner", "flying banner", airads, Simon Moores, Sky Banner"
Two aircraft up simultaneously for several hours above the Radio One 'Big Weekend' today at Mote Park in Maidstone, both promoting different music events for a client. We are back again on Sunday morning and lunchtime and I hope to be able to put together a short, 'YouTube' video for people to watch. In the meantime, here's a link to all today's aerial photos of the event, taken as we circled it. The weather was great! A frantic rush to an airfield on the Eastern edge of London this morning in time to fly a banner supporting Boris Johnson's campaign for Mayor, today being the big day of the London and local elections. The thunderstorms presented a bit of a problem, very unusual so early in the day but we got there, flew the banner and hopefully had the photos back in time to meet the Eveing Standard's deadline. A frenetic day on Saturday, with the Churchill Estates banner to fly over North London and a second, over Camber Sands, in the afternoon. Showing my age, I won't pretend to understand what the message on the latter: "Bang Face Hard Crew" meant, we just fly them on demand and I certainly wondered what the people on the beach below made of it all. We used Lydd Airport for the first time in ages to operate from and they were extremely helpful. Below, there's a small YouTube video of the view back into the airport when the job was done. Next weekend, it's Skegness for two days. Last year, the early Bank Holiday flights were 'Weathered-off' so fingers crossed to avoid disappointment this year. I'm still amazed that nobody has contacted us over Radio One's 'Big Day' next month, outside Maidstone. With a quarter of a million ticket applications and the event only two minutes flying time away, it's a prime location for aircraft-based advertising. Up above the Isle of Thanet this morning, testing out the new video camera and having a quick practise session in TG's Piper Arrow. It's a bit quicker than the sedate, banner-towing, Cessnas with a constant speed propellor and a retractable undercarriage but alot of fun once one has the measure of it; it's a bit twitchy at first. The video, shot by Alasdair Bruce, shows Thanet from above and the approach in Manston airport's runway 28. Staying with the football theme - I flew back from Milan with England Manager Fabio Capello last week - The Sport Academy in Loughton, North London, called us at short notice, yesterday, asking us to fly a banner this afternoon, promoting their St George's Day football, 'Fun Day'. Given that Monday's weather was dire, I didn't have any great hopes that we might be able to do it but today, by remarkable contrast, was like an early summer's day, with glorious sunshine over the south-east of England. And so it was back to Daymns Hall, now renamed as Hornchurch airfield, to set-up and collect the banner for the 'Fun Day' which all went to plan and included a short YouTube video as well. We must buy a new camcorder with so many customer videos now going online. Great coverage on Sky News this morning for AIRADS client, Churchill Estates, to support the story on the expected Bank of England interest rate cut and the decline in the housing market. We were up at Rochester yesterday, filming with news editor, Joel Hills and on a glorious spring morning Sky captured some excellent footage of the Churchill banner before we flew off to North London to display it. At 07:30 this morning I had a call from a delighted Managing Director of Churchill's who had been watching the report on the morning news. The end of Margate's famous 'Roller Coaster' the 'Scenic Railway' caught by a passing Airads flight on Tuesday. Police suspect arson and one wonders whether the damage to this historic wooden structure is too much to be repaired? If the weather holds-up this week, Sky News is set to join us for a 'mission' over London and to film a piece on aerial advertising. It's going to take a little arrangement, having the Sky helicopter, the banner aircraft and of course a camera crew and the client, all working together out of Rochester. The latter is presently recovering from the weekend's snowfall and is closed and so we are rather hoping that it will be dry in time to avoid having to think about a "Plan B". The banner over Everton , for the fans yesterday, Sunday, was a bit of luck, given the weather so Free Tibet's loss was arguably Everton's gain. The approaching cold front ruined another weekend's flying. It strikes me that we have had almost five weekends of strong winds with gaps of pleasantly warm Spring weather in-between. 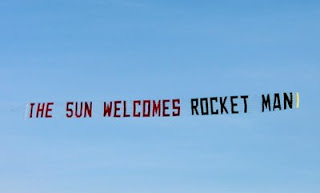 Having gained permission to land late at Rochester this Sunday, we've reached our deadline for a decision and have heard nothing further from one client who asked if we might 'surprise' the finish of the Olympic torch ceremony with a 'FREE TIBET' banner. On a personal note, I think that the message might well have made a more peaceful impact than demonstrators lining the route of the torch relay but then it's not for us to judge such things as we simply facilitate an airborne message request for our clients. Sunday morning and a bit of a challenge, with a telephone call from Abu Dhabi. Apparently, the ruler of this wealthy state wants a special banner flown for him this week, to celebrate his son's birthday but while we are delighted to have been approached, as the most visible operation outside the United States, the logistics required present an enormous challenge, even with our partner banner operation now operating in Dubai. The impossible we can achieve but miracles can present us with a real challenge! Departing in minimal visibility, we were in the cloud past Rochester and pretty much until Ockham, remaining "VFR on top" at 2000 feet but found, to our surprise as we passed Blackbushe that the weather, although not great, looked good enough for the flight. 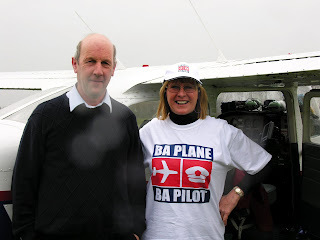 While one of us filmed, AIRADS Chief Pilot, John Waller, took BALPA's Head of Flight Safety, Carolyn Evans, along as co-pilot. (Pictured) Off first towards Reading and then with the approval and control of Heathrow ATC, along the M4 towards Slough and the Burnham beacon. 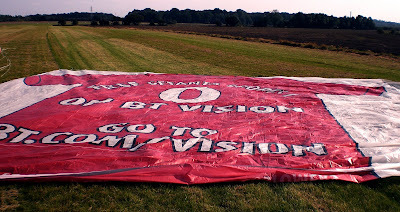 By then the rain had started and the cloudbase was starting to fall but John, as you can see from the video, bought back a very wet and "draggy" banner to drop at Brimpton without mishap. It was raining so hard, I couldn't get any decent photos! Because the background was so dull, the banner photo is colour enhanced which is why you can see the smaller tail-flag 'parachute' - actually a different colour which normally goes unnoticed - at the end of the banner. Otherwise it wouldn't fly horizontal! I'm looking forward to getting a souvenir T-shirt! Footnote: A warm welcome to all the BALPA members from all around the globe that are visiting this website in large numbers from Cape Town to Tokyo - from looking at the traffic log - . If you don't have the Adobe Flash Player installed on your PC, you won't be able to see the You Tube video. Flash Player is easily downloadable but on some public PCs it's either not installed of turned-off with the Active-X controls for security purposes. As today's strong winds have put a stop to any flying work I had, I've been having a quick look through some of my videos and remembered this one, that I took of Spitfire U2. Corgi even produced a special collector's edition scale model of the same aircraft that I have on the shelf in front of me. Thanks to the wonders of YouTube, I can now share this short clip with any Spitfire fans or history enthusiasts. The rain that day was so bad that the fresh blue paint on the Spitfire started to wash off! On the wild side out there this afternoon but divine providence helped one young lady from Germany propose to her boyfriend at Bluewater a little earlier, although I had told her that the chances of getting a banner overhead were slim. It's not much fun when it gets that turbulent and the temptation is to simply say "No" than give it a try but miracles sometimes happen and I hope they'll both be very happy together! You'll see how close we have to work to the ground in this picture from this afternoon. Two flights out of Rochester today, bringing the legendary 'Captain Bob' out of self imposed retirement to fly a banner for Trade Depot to announce the opening of their Croydon store. Since 'Captain Bob' decided to start flying a Bell Jet Ranger helicopter, with its leather fitttings and generous mini bar, fixed wing aircraft have become a little passe but the old skills were very much in evidence, with a neat pick-up and an even neater drop, right between the posts. The day started 'Murky' and didn't really improve that match. Much of North Croydon had a fog bank sitting neatly over the top of it and so we had to be a little imaginative moving around the outskirts and the M25 to avoid it. Hopefully, the visibility will be a little better tomorrow. Here's a quick video of the return to Rochester airport. See us this week on ITV's Meridian News Tonight special story on Leap Year proposals. Friday may be busy. The weather forecast is not good though! Very tricky weather today but sterling work from John W. ensured that Richard's proposal to Hannah arrived in time at Southend pier for 3pm, where she was waiting for an unexpected surprise. Not exactly the finest weather to be out on the pier, drizzle and low cloud but like the fabled "Pony Express" Airads managed to get there and the girl said "Yes". Another succesful marriage proposal to add to our 100% record! I've attached a short YouTube video. It's not great as I only had my little camera with me and the light was very poor. Hope you can see the major details though! Trade Depot has selected AIRADS to publicise the opening of its new store in Croydon at the beginning of March. To support the flights, the company is having a "Split" digital sheet banner designed, which can of course be used for other stores and messages if required. The banner involved allows interchangeable 5' letters to be attached to the end to give greater flexibility for different messages. A full page spread for AIRADS in one local paper and again in a second for the City of Canterbury, following our last flying marriage proposal. Given that the latter involved flying round and round the city walls with "The Big Question", the people of Canterbury were bound to notice in the week before Christmas, much as the people of the Isle of Thanet did at Westwood Cross with our charity Xmas Card in aid of the NSPCC, sponsored by the island's 'Bloggers'! Valentine's Day and the Leap Year are approaching fast. You can tell because it's increasingly wet and windy, making it very awkward for us to operate. Fingers crossed we aren't rained-off in February again! 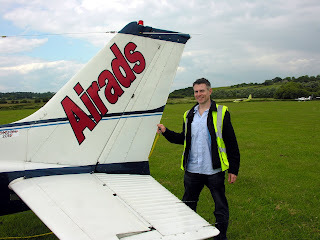 Welcome to the Airads weblog, home of Captain Snap photography and professional 'Sky-High' advertising.